21 Pcs Wind Back Tool - SMANN TOOLS. This is suitable for Audi, Fiat, Ford, Isuzu, Handa, Jaguar, BMW, Mercedes Benz, Mitsubishi, Nissan, Toyota, Renault, Volvo, Citroen, Opel, SAAB, GM and VW. 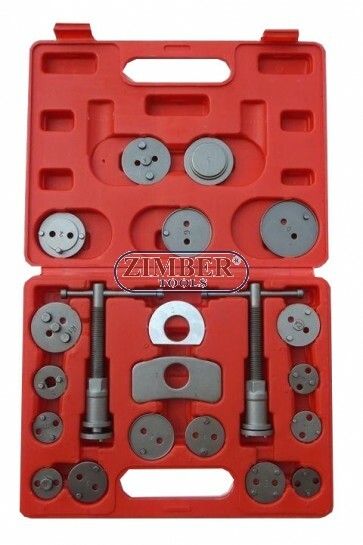 21 Pcs Wind Back Tool - SMANN TOOLS. 4. FORD Australia/NZ Telstar,Laser(R).MAZDA(R).SAAB 9000(R).FIAT/Alfa Romeo 164 2.0(R).HONDA/Prelude,CRX 16i,GM/Saturn(R). 5. 3/8”dr.Adapter used with extention bar and ratchet when need to apply more strength to thepiston. FORD/Sierra ABS,Granada,Scorpio ABS 85(R).NISSAN/Bluebird 1.8Turbo,Silvia Turbo,Primera 2.0i LS/GS/GSX(R).PEUGEOT/405 1.9Gi,Gri,Sri,Gtxi,MI 16,605 2.0 Sri(R).TOYOTA/Celica,Corolla GT,MR2(R).VW/Golf Gti,Jeta Synchro,Jetta Gti 16V,Passat CL,GL,GT and GT 16V,Corrado 16Vscirroca GTX 16V(R). 8. GM most 1-7/8”diameter pistons.